The 37th president had more to lose than most, but others have fallen as hard. camera (AP Photo) President Richard Nixon pounds his fist on the podium as he answers questions before members of the National Broadcasters Association in Houston March 19, 1974.
intro: Before President Nixon officially resigned 40 years ago tomorrow, he had assured Americans that they deserved to know whether their president was a crook. 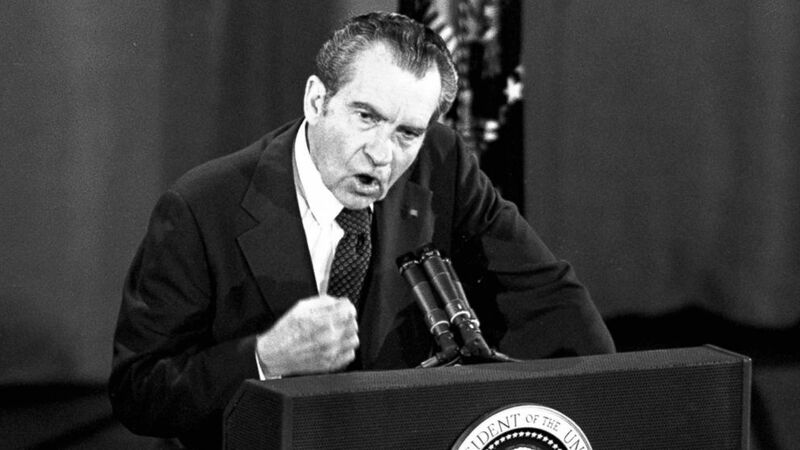 "Well," he told a Nov. 17, 1973, news conference, "I'm not a crook." With that, the beleaguered commander-in-chief painted himself into a corner from which resignation offered his only escape less than a year later, Aug. 9, 1974. With far less at stake, other politicians have flat-out lied about their actions at the risk of public humiliation or, at worst, career suicide. quicklist: 1 Category: Political Deception title: 'I'm Not a Crook' url: text: Nixon never confessed to any wrongdoing, although he did accept blame for misleading the public on when he learned the truth about the break-in at the Watergate Hotel. The scandal counts as the most explosive political deception in U.S. history, cutting short Nixon's second term despite his parting words that "I have never been a quitter." quicklist: 2 Category: Political Deception title: 'I Did Not Send That Tweet' url: text: Former Rep. Anthony Weiner, D-N.Y., thought so much of himself that he took to Twitter with images of his crotch. He repeatedly denied sending the tweets, telling ABC News' Jonathan Karl in 2011, "I did not send that tweet. My system was hacked, I was pranked." Weiner, 49, eventually confessed and apologized for lying, but resigned under the weight of his deception. quicklist: 3 Category: Political Deception title: 'Oh, Yes, It's Been Over for a Long Time' url: text: Former Sen. John Edwards, D-N.C., told ABC News' Bob Woodruff in an August 2008 interview, after he'd suspended his faltering presidential campaign, that his affair with mistress Rielle Hunter ended in 2006, and that there was no way her child was his. Neither was true and his deceit irreparably damaged his political career, not to mention his marriage. quicklist: 4 Category: Political Deception title: 'I Did Not Have Sexual Relations With That Woman, Miss Lewinsky' url: text: President Bill Clinton and no-name intern Monica Lewinsky made for an unlikely pair, and their sexual encounter resulted in his becoming a target for impeachment after he denied and then confessed to the relationship. His presidency survived the perjury and abuse of power charges and Clinton, 67, remains enormously popular today, yet his reputation has never fully healed. quicklist: 5 Category: Political Deception title: 'It's All Made Up. I Don't Know What Happened' url: text: Police alleged in March 2002 that an officer who approached former D.C. Mayor Marion Barry's parked car noticed a "powdery substance" under Barry's nose after seeing him "ingest something." Officers allegedly found $5 worth of crack cocaine in his car, according to the police report, an insufficient amount to warrant further action. Barry, now 78, escaped prosecution but his wife moved out shortly thereafter upon learning of the incident from the media. Barry said he didn't consider the incident a big enough deal to tell her. quicklist: 6 Category: Political Deception title: 'I Didn't Lie to the FBI' url: text: Former Illinois Gov. Rod Blagojevich insisted throughout his prosecution that he had been honest in his dealings with FBI agents investigating the corruption charges that swirled around him. In the end, however, he was convicted of lying to the FBI in 2005 about, among other things, not keeping track of his contributors and how much they contributed. Blagojevich, 57, is now in federal prison on a 14-year sentence.